A full length release from The Resistance is to be expected in May and until then this four track thirteen minute EP will have to do. With members hailing way back in the Swedish metal scene no further presentation of the band is necessary. This new constellation of well known musicians pretty much play traditional death metal and on the contrary to his former companions in In Flames, Jesper Strömblad has gone back closer to his death metal roots and not to more mainstream. When I listen to this EP, Face To Face is the only song that I really dig and who gets me going and especially the striking lead guitar play is what catches my attention. You have heard these patented lead guitar loops before and they remind me of a couple of In Flames songs released before they became a band in everyone's CD rack. 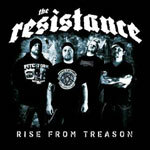 The title track, Rise From Treason, is a decent song with its angry appearance, but My Fire and Slugger seem just like two death metal tracks following the standards. In four months we will know the full outcome of this new band and thirteen minutes is not enough to evaluate how this will eventuate. Until then, I'm not that satisfied with this release and with this lineup I hope they have saved some of the better tracks to the coming album. 4 chalices and my expectations are now lower than they were, as I was hoping for a massive neckbreaker.